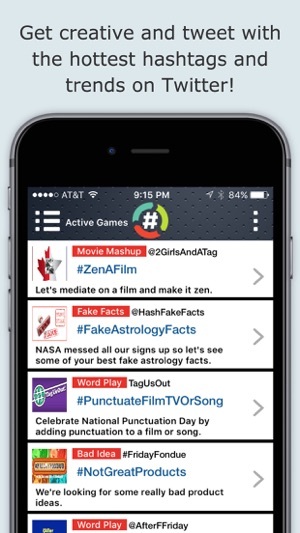 Hashtag Roundup develops and promotes (large amounts of) original content daily on Twitter. Play along with our hosts/games. 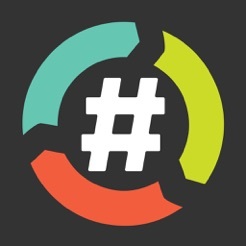 Be part of the 200+ top trending hashtags we create monthly on Twitter. Notifications alert you when new games begin, so you’ll never miss another hashtag game again! Are you ready to be an Ultimate Hashtag Warrior? 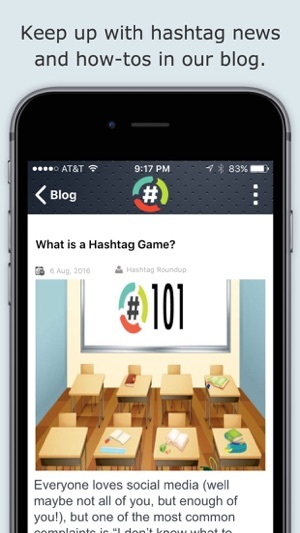 [+] HASHTAG GAMES - Engage in current hashtag game events on Twitter. New games throughout the day. 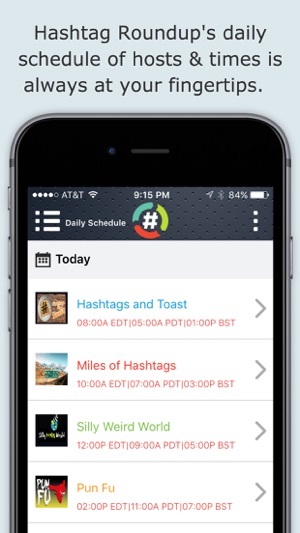 [+] NOTIFICATIONS - Get notified on your phone the moment a new hashtag game becomes active. Never miss a game! [+] BEST OF LISTS - The best and most humorous tweets from select games are featured. 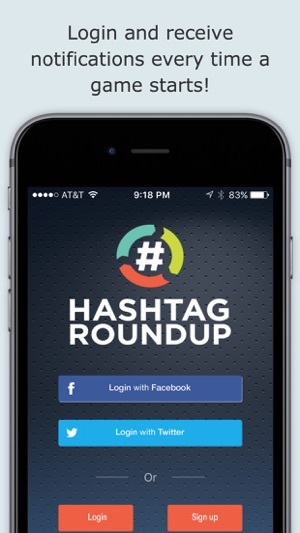 Simply copy and paste the hashtag from Hashtag Roundup into any of your favorite Twitter apps to tweet! 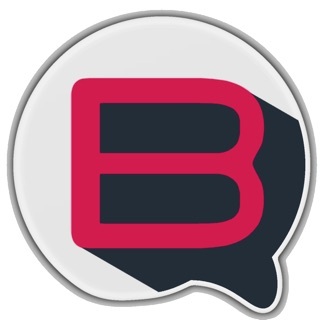 The full tweeting functionality you’re familiar with is at your fingertips. As always have fun but remember: Hashtag games are addictive. If you like to play hashtag games, you will love this app! Whenever a new game starts, it alerts you, so you can join in at the start. You can also check the app to see all the games that are currently active, and jump in at any time. If you like to plan ahead, it has a list of scheduled games for the week, but unscheduled games happen quite often. The app alerts you to every one, so you won't miss out. From a single screen, you can follow the feed for the hashtag, retweet or favorite other tweets, and post your own (without having to type out the hashtag, which is nice). Right now, you can only view 100 tweets at a time and need to refresh to see more, but that's a Twitter thing, not the fault of the developers. There is a points system that keeps track of your cumulative score over the week, if you need the self-esteem boost. ;-) Every Sunday the scores are set back to zero, so anyone has a shot at that week's leaderboard, whether they've been playing forever or are a newbie. 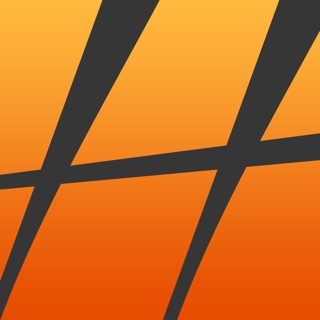 The app's website has all the basic info and FAQs, plus some bonus content. When I contacted the administrator (is that the correct term? ), they replied quickly and answered each of my questions point by point. I think it was the most thorough customer service response I've ever received! The folks on Twitter who play these games are really fun, and the Hashtag Roundup app is a convenient way to interact with this great community. Tag Warriors must have this! 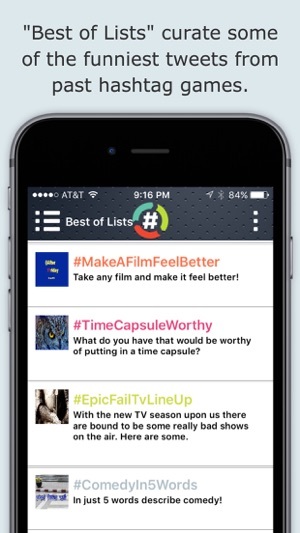 The Hashtag Roundup App will easily keep you on top of each new game right as it happens. Wondering what games are playing? This tells you, and allows you to tweet your genius submissions right through the app. No more fears of spelling the tag wrong. There is even a complete schedule of the hosted games that are run each week and you can get reminders when your favorite games begin. Also, the built in scoring system and leaderboard allow each player to track the relative success of his or her most recent tweets. I still use Twitter on a daily basis, but if I want to get right to playing hashtag games I use the Hashtag Roundup app. It's quick, engaging, and let's me spend more time playing and reading great game submissions and less time figuring out which tags are trending. 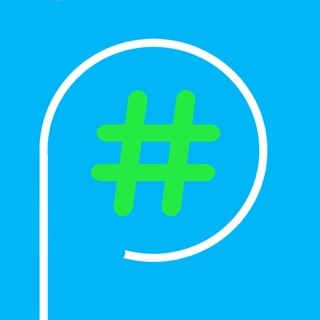 Please support the Hashtagger Community and play games and support the best app ever developed to make your time spent gaming easier and more productive.